If you've ever crossed several time zones during a long flight, you will most likely have experienced symptoms of jet lag. No matter how seasoned a traveler you are, jet lag is a common problem that most everyone deals with, some better than others. At its heart, jet lag—also known as desynchronosis—is a mismatch between your internal and external clocks. Your internal clock, better referred to as the circadian rhythm, is a biological cycle regulated by things like sunlight, temperature, personal habits, and the cyclical release of hormones that modulate your sleep/wake patterns. When external stimuli are not aligned with your internal clock, symptoms of jet lag can occur, including fatigue, insomnia, daytime sleepiness, headaches, indigestion, irritability, and a lack of concentration. The more time zones you cross, the worse your symptoms may be. Traveling east is more difficult because it extends the daylight hours upon arrival, making it harder to stay awake until dark or asleep until sunrise. When flying west, you lose daylight hours, so can adjust more readily to the sleep patterns. Fortunately, there are a number of remedies that can help. Chief among them is exercise. By compelling your body into physical activity, you can overcome fatigue, insomnia, and other jet lag symptoms better than you would by suffering through it. While exercise has little direct impact on your internal clock, it can increase the length and quality of your sleep during the adjustment period. This is because, under normal circumstances, circadian rhythms peak earlier in the day when we are the most active. By increasing your heart rate and respiration through exercise, your body will respond in much the same way: by peaking at times when it might otherwise be winding down. This can have a direct effect on how long or short your jet lag symptoms will last. One oft-cited study, in which hamsters were exercised early or late at night (which corresponds to early or late in the day in humans, since hamster are nocturnal), showed that jet lag lasted only 1.6 days in the exercised hamsters compared to 5.4 days in the non-exercised hamsters. A study from Japan, which observed flight attendants traveling from Tokyo to Los Angeles (an eight-hour time difference), concluded that outdoor exercise cut jet lag recovery time from four days to three. Most current evidence suggests that exercise does not so much re-synch the circadian clock as it increases arousal levels in people suffering desynchronosis. Can Light Therapy Glasses Help With Jet Lag? There is little evidence as to which types of exercise are "better" for jet lag than others. Most experts would advise you to embark on light to moderate exercises, such as yoga, jogging, or light resistance band training, rather than jumping into a high-intensity workout. After all, long flights tend to leave you dehydrated, and the last thing you'll want to do is sweat out whatever water and electrolyte reserves you have left. Exercising outdoors is especially useful as your body will respond to the intensity of the light as well as the temperatures by releasing endorphins, dopamine, and serotonin, the hormones associated with alertness, cognition, and well-being. In terms of exercise strategies, there are things you can do before, during, and after your flight. While you're still fresh and full of energy, try a moderate intensity workout before your flight to give your metabolism a boost and rid yourself of any travel stress. If you have an early flight and don't have time for a full workout, try doing some yoga or a total-body stretch at home. This will help increase flexibility and blood flow in advance of the long haul. Avoid high-intensity workouts before a long flight. Placing excessive stress on your body is never a good idea if you are about to spend the next six to eight hours in a cramped seat. 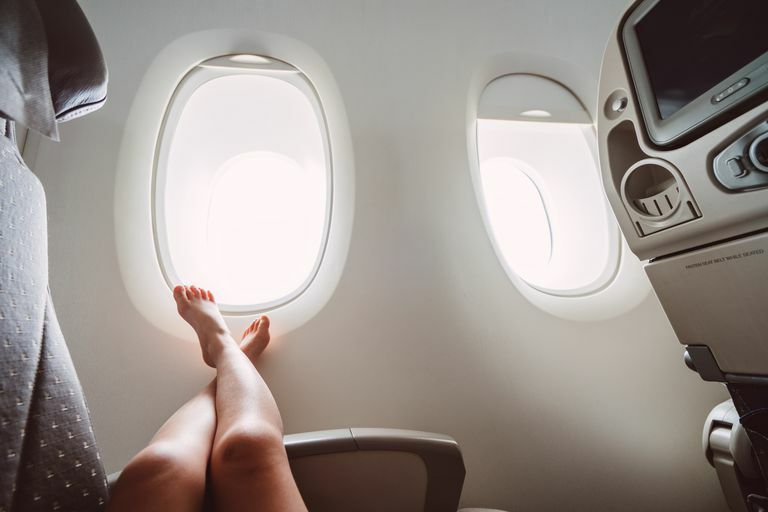 The pooling of blood in your lower extremities will only exacerbate post-workout inflammation, placing even more burden on a body already suffering the rigors of air travel. Though it is tough to move around in such a small space, there are plenty of isometric exercises you can do to keep the blood, muscles, and joints moving. They can even help reduce the risk of deep vein thrombosis (DVT), a condition in which blood clots suddenly form in the veins of your calf or thigh. Ankle circles: Circle your foot clockwise and then anticlockwise. Repeat 10 times per foot. Foot pumps: Raise your heels together, contracting the calf muscles at the top, and release. Repeat 10 times. Knee hugs: Raise a knee toward your chest, hugging it at the top for 10 to 15 seconds, and then release. Repeat 10 times per leg. Neck rolls: Drop your ear toward your shoulder and gently roll your head from side to side, 10 times per side. Shoulder rolls: Slowly roll your shoulders forward, upward, backward, and downward, and then reverse directions. Repeat 10 times. Forward bends: Bend as forward as your seat allows, reaching to grab the front of your knees. Hold for 10 to 15 seconds and ease yourself. Repeat 10 times. Seated spinal twist: In your chair, twist your torso to the right and hold the armrest with both hands to stretch your back and spine. Then rotate the torso to the left and hold the same position. Repeat the routine every two to three hours while you are in flight. You should also get up every two hours to walk and stretch your legs for at least five to 10 minutes. To help combat jet lag when you arrive, take a brisk 20- to 30-minute walk outdoors in the fresh air. If it's not too late in the day, follow up with a light workout (with low weight) in the hotel gym. If you don't have access to a gym, try a no-weight workout in your room or follow a gentle yoga routine on your laptop. The next day and for several days after, follow the same gym routine you would at home. If you workout at 8:00 a.m., do the same in your new time zone. Even though you may be on holiday, doing this for the first two or three days can pay off by improving alertness and reducing fatigue. While some people will tell you to exercise in the morning if you are flying east and exercise in the afternoon if heading west, there is no evidence either will alter the circadian rhythm. Remember that the aim of exercise is to fight the rigors of jet lag, not reset your biological clock. The one thing you do not want to do is exercise late at night. Doing so will it make it harder to wind down if you're jet-lagged and may only increase the risk of insomnia. Limit alcohol and caffeine during your flight and 24 hours beforehand. Both have a diuretic effect and may interfere with the sleep you should be getting in flight. Upon arrival, eat soon after you land and as close to local meal time as possible. Keep to a normal meal schedule based on the local time, restricting your meals to a 12-hour window (for example, 8:00 a.m. for breakfast and 8:00 p.m. for dinner). Avoid excessive light exposure, including bright electronic screens, at least one hour before you plan to go to sleep. The supplement melatonin may help improve sleep/wake patterns in the first three days after landing, although drowsiness and dizziness are possible. Another natural supplement known as pycnogenol (pine bark extract) is believed to decrease jet lag symptoms, although it may cause dizziness and upset stomach. Lee, A. and Galvez, J. Jet Lag in Athletes. Sports Health. 2012 May;4(3):211-16. DOI: 10.1177/1941738112442340. Mrosovsky, N. and Salmon, P. A behavioural method for accelerating re-entrainment of rhythms to new light-dark cycles. Nature. 1987 Nov 26-Dec 2;330(6146):372-3. DOI: 10.1038/330372a0. Shiota M, Sudou M, Ohshima M. Using outdoor exercise to decrease jet lag in airline crewmembers. Aviat Space Environ Med. 1996 Dec;67(12):1155-60.